I really enjoyed this author's earlier book, BLACKBIRD FLY, and I was excited to read this one! 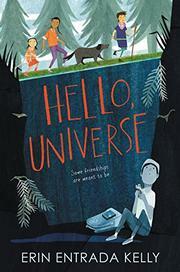 Hello, Universe by Erin Entrada Kelly was published by Greenwillow Books, an imprint of HarperCollins Publishers in 2017. I really loved how the kids in this story figure things out on their own. They stand up for their friends and for others in a caring way. I also liked the way Virgil learns to be braver and speak up about what he wants. This story includes diverse characters in a way that makes their diversity an integral part of their lives and the story, without being a main focus. I enjoyed the humor in the story, much of which comes from the tag-along little sister. You know how sometimes you’re friends with someone and they start hanging out with other people and eventually you’re not friends anymore, but you can’t remember when it all happened? Well, that’s not how it was with Roberta. I know the exact date: October twelfth, fourth grade. I'd study this book to learn about character development. The diverse and interesting characters are really what makes this book special. I was impressed by the distinctiveness of the different characters and their points of view. I also loved the way the author used specific details to bring out character and setting. …I know the woods like the back of my hand. I know there’s a special clearing where groundhogs come out at dusk. I know there’s an old abandoned water well that’s missing its rope and pail, which tells me that the woods used to be an empty field where someone had a house, which means that the trees are young, at least as far as trees go. Since this book won the 2018 Newbery Award, it’s likely going to show up in your school or public library. I love the way this book focuses on kids who are a little different – the girl with hearing aids, the shy and nerdy boy— and shows us their rich, full lives. The school bully was portrayed realistically, and the dialogue between the kids was really well done. An interesting book for a class read aloud. Instead the Bull took a giant step back, grinned evilly, and turned toward a stumpy circle of stones that Virgil had never noticed before. It was an old well. With two hefty shoves, the Bull pushed the cover of the well aside and dangled the backpack over the now-open hole. “Say bye-bye to your stuff, retardo,” he said. Erin Entrada Kelly is the author of two other wonderful middle grade books, Blackbird Fly and The Land of Forgotten Girls. If you'd like to read my thoughts on Blackbird Fly, check out my post here. I enjoyed Blackbird Fly and have this one high on my list to read. Thanks for your thoughts. It's a holiday today so I have time to add your post to today's MMGM. This book is intriguing to me because of its diverse set of characters and the awesome cover art. Thanks for featuring this title. I have seen a couple recommendations on this book. I even checked it out of the library once, but did not get a chance to read it. The fact it won the Newbery pushes it up the list. Newbery winners have rarely disappointed. Thanks for the review and reminder! I put it back on my list.